Revision spinal surgery is a reparative procedure performed on a patient who has already undergone previous spine surgery. The most common reason for revision spinal surgery is continuing pain. Typically, by 3 months after a surgery has been completed, any lingering pain is gone. When a patient is still reporting chronic pain after this time, revision spinal surgery may be considered. The goal of the second surgery is the same as the goal of the first procedure: to reduce or eliminate pain and allow the patient to resume work and other normal activities. Besides chronic pain, revision spinal surgery may be necessary to repair a surgery that was performed incorrectly or at an incorrect site or to correct postsurgical complications. Unfortunately failed spinal fusion surgery is a fairly common reason for revision spinal surgery. Although spinal fusion can be an effective treatment for chronic back pain, a relatively sizable percentage of spinal fusion surgeries are unsuccessful and require further surgical intervention. Fusion failure may occur as a result of hardware problems, new spine issues just above or below the fusion site or recurrent medical conditions such as spinal stenosis or spinal instability. Revision surgical fusion involves implanting a new bone graft in the affected area. Sometimes a bone growth stimulator is implanted as well. Previous instrumentation placed within the spine may be removed during this procedure to make room for placement of the new graft and to help the bone heal properly. The decision to opt for revision surgery depends on the diagnosis made after the initial failure. In many cases, the cause of fusion failure is unknown, which further complicates the decision-making process. Revision fusion surgery is a much more complicated procedure than initial fusion surgery and carries more risks for patients, including the possibility that tissues will not heal properly. 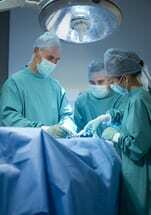 There is a higher risk of infection following a second surgical procedure. Serious patient-doctor consultation is advised before the decision for revision spinal surgery is finalized. The exact procedure performed varies from patient to patient depending on the reason for the revision spinal surgery. This surgery always requires a hospital stay of several days. Sometimes patients are fitted with temporary braces or collars after revision surgery to assist in keeping the spine staple during recovery. Physical therapy is usually begun very soon to help patients to regain strength and mobility. During the first few post-operative weeks, patient activities are severely restricted. As healing progresses, the patient is able to gradually resume normal activities. Depending on the nature of the revision spinal surgery performed, recovery takes from 6 weeks to 3 months.